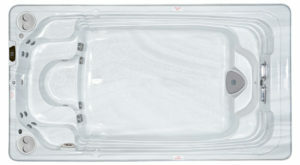 Swim spas by Hydropool are the perfect way to swim every day – even during the cold winters in Maine. Imagine never having to turn, touch or push off from any wall. Our swim current gives you the ability to focus on your stroke technique and enjoy the fluidity of the swim current adjusted to your personal swim level. Our AquaFlow Swim Jet design provides a wider, deeper, smoother current and our tank design has no hidden obstacles like steps or benches for your feet to hit in the swim lane, giving you a far superior swimming experience than any other swim spa available today. HydroPool AquaTrainer 14fX Swim Spa – Imagine training year round even in Maine! 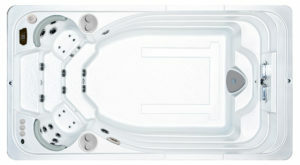 Train year round in the HydroPool AquaTrainer 14 iX even in the cold winter of Maine. Variable resistant, adjustable current stream, the thigh/abductor jets for lower body massage and resistance exercises and two hydrotherapy massage seats. Adjust the current from a gentle front crawl to a 1:02 hundred-meter swim pace a challenge for even a competitive swimmer. The aquatrainer-19-fx-swim-spa – A mini-pool with dual zones that deliver the most flexibility, fun and benefits for the whole family year round. 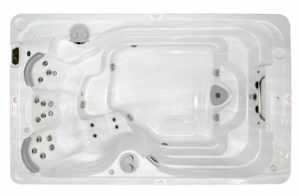 The HydroPool AquaTrainer 19 DTfx – It’s a Dual Temp Swim Spa, a hot tub, a gym, and a swimming pool all in one.